Heard this one before? “If you create great content you will find a large audience.” It’s nonsense. Or at the very least, it’s idealistic. It’s like if you make great music you’ll become a rock star. The omega replica watches number of great bands that are painfully undiscovered is, well, painful. You need to create something great and be discovered. In my articles I tend to focus on the “create something great” half of the formula. Today I’ll focus on the “be discovered” part, which is largely a mechanical exercise you may not understand—or have never considered. That’s one way to use keywords—cram ‘em into your article or page. But it’s not the best way. The best way is to use keywords in your headline. Your headline (or title) carries the most weight. It’s atop the list of what the search engine seeks. When the title matches, in some way, what the search engine user has entered, it’s what gets presented in the search engine result page (SERP). Sounds downright simple, doesn’t it? It is and it isn’t. You begin with an idea for your content, which of course, should track to your marketing objectives. I’m going to use the article you’re reading now as an example to guide us through this “how to” lesson. First up is my strategy. I’m an online marketer, a specialist in content marketing strategy and writing. A tactic that has proven enormously effective for generating interest in my services is to position myself as an expert by contributing guest posts at great websites like Convince and Convert. As a guest blogger here, we have a good fit, a win-win. Convince and Convert gets relevant content that serves your needs. Feldman Creative gets exposure to the large, marketing-minded and engaged audience of Convince and Convert. I encourage all my clients to become not only bloggers, but also guest bloggers. Convince and Convert has a loyal following of subscribers, so I’m likely to benefit when an article I’ve written gets posted—even if I don’t follow the advice I’m giving you now. But I can help myself and this website by practicing some smart keyword research. The intention being, non-subscribers will discover the article at Google, Yahoo and Bing, the top three search engines, which are the 1st, 4th and 16th most visited websites in the world. Back to the starting point now: the idea for your content. Got one? For this post, the idea is essentially to give a lesson in SEO. Your subject is just the beginning. A Google search for “SEO” produces 567,000,000 results. If I don’t do any keyword research, my article will compete on that very large playing field. Finding a narrower, more focused idea is the next step. 9,080,000 for an phrase match on “SEO and content.” (Put quotations around your keywords to search for a phrase match). 639,000,000 for a broad search (no quotes). In this case, using more words didn’t help narrow the field. Get out a power tool. Anyone can do the research we just covered, but as you saw, it’s only a wee-bit helpful. Learning how many search engine results a keyword or keywords phrase invokes isn’t nearly as powerful as learning how often the keywords are searched and to what degree online advertisers compete for them. SEO: 9.14 billion global searches; and an advertiser competition rating of 52. SEO and content: 27.1 thousand searches; and an advertiser competition rating of 53. Bad news. If my keyword research goes no further, this article will have some mighty steep competition. 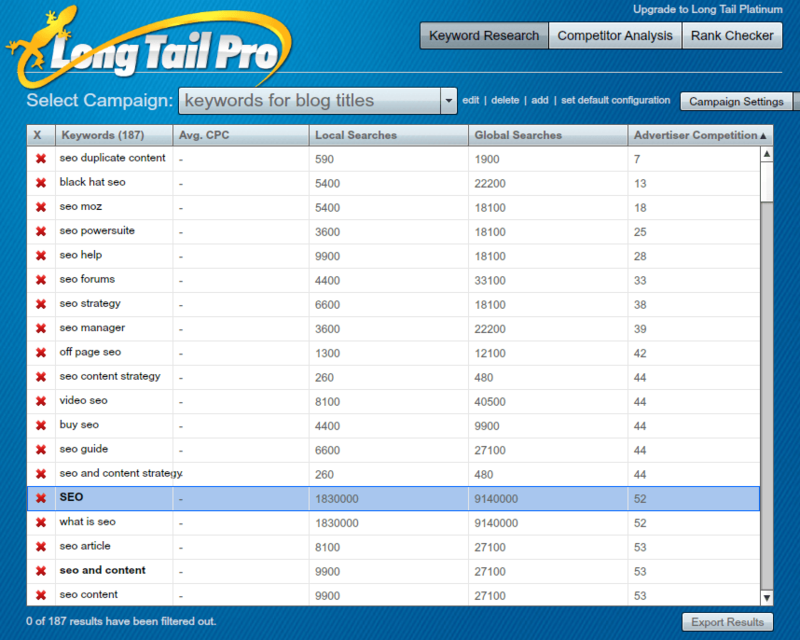 However, in addition to giving you search data, Long Tail Pro also gives you all kinds of ideas for alternate keyword ideas. I examine these ideas. There are 187 of them, so I sort them by competition, low to high. As I hope you’ve gathered, I’m aiming to stay on topic, but identify a low competition keyword. I feel like Goldilocks. Nothing feels just right. Now think of something else. “What else have you got?” I ask myself. A Plan B occurs to me. What I’m really writing about is keywords: keywords and content. Separately, I’ll face the same problem, but together, well, look at what we have here. Perfect. Long Tail Pro delivers good news. The search volume is substantial and the competition is low. I have a plan. Notice I got the same results for the four variations (using “in,” “for,” “and” or no “tweener” word at all made no difference). Google doesn’t factor the non-essential words. Good to know. So I have what I need. My headline will include “keywords and content.” The article will teach you how to find a large audience by using a reputable platform, a marketing strategy, keyword research and a little creativity. I think I’ll call it “Finding a Large Audience at the Corner of Keywords and Content.” And I think it will rank high in search engines over 8,000 times per month for many months to come. Try it yourself. It’s very effective. Barry Feldman is the author of SEO Simplified for Short Attention Spans. Barry operates Feldman Creative and provides content marketing consulting, copywriting, and creative direction services. He contributes to many of the web's top marketing sites and was named one of 25 Social Media Marketing Experts You Need to Know by LinkedIn. If you would like a piece of his mind, visit his blog, The Point.